HONG KONG, March 28, 2019 /PRNewswire/ -- A scholar from Hong Kong Baptist University (HKBU) has developed a new series of games which can be used to train and test children's reading, writing and word identification skills at an early age. 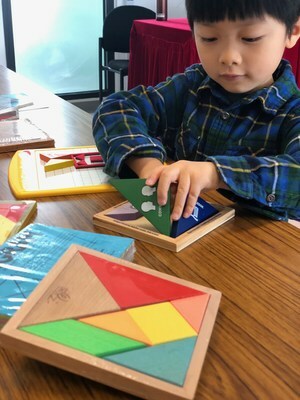 Based on the principles of traditional Chinese tangram games, with this new method teachers and parents can easily identify children with early visual processing difficulties. This will enable the provision of suitable support and training to children in need, while also enhancing their learning outcomes. The games can also be used to test children's visual-orthographic skills, which refers to their ability to recognise the correct orientation of characters, letters and numbers in a particular language. Led by Dr Simpson Wong, an Associate Professor from HKBU's Department of Education Studies, the research team took traditional tangram games as a reference and developed five games in total. The other researchers involved in the project were Dr Rebecca Cheng, a Principal Lecturer from the Department of Psychology at the Education University of Hong Kong (EdUHK); Miss Sandrine Chung, a PhD student from EdUHK; and Dr Bonnie Chow, an Associate Professor from the Department of Social and Behavioral Sciences at City University of Hong Kong. Dr Wong said that in many Asian countries large populations of children have to learn two languages at the same time. If those two languages – for example, Chinese and English – have distinctive writing conventions or orthographies, the children need to understand two different scripts and receive more visual instructional training in order to achieve better learning outcomes. In view of this, the team decided to develop games to help train and assess young children's visual-related literacy skills. As part of the study, the team invited 102 Chinese kindergarten students aged between 4 and 5 to play the games. The researchers then studied their performance and explored the correlation between the tangram games and kindergarteners' visual-orthographic and word identification abilities. This game was designed to test children's visual-spatial skills. The experimenter displays one figure, and each child is then provided with a set of tangram puzzle pieces and has to reconstruct the same figure. This game aims to test children's short-term visual memory. The experimenter shows a tangram figure to the child for about four seconds and then asks the child to select the previously shown figure from a choice of four different tangram figures. This game estimates hand-eye coordination speed. The experimenter shows a paperboard with four-line tangram puzzle to the child. The child is then asked to place the tangram puzzle pieces from left to right and move them to the designated box as accurately and quickly as possible. This game involves the application of fine-motor skills. The experimenter presents a tangram figure containing one to five tangram puzzle pieces and asks the child to draw the figure on a blank sheet of paper. This game estimates the child's ability to identify the objects, animals, or actions depicted by tangram-made figures. Tangram-made figures have higher levels of abstraction and demand that children have more advanced visual pattern recognition skills. Having played the games, the research team then compared the scores of participating children in the tangram games with their performance in other assessments, such as teacher completed Child Learning Behaviour Checklists, Raven IQ tests, Chinese and English word reading tests, and visual-orthographic skill tests. The study found that the children's scores in the tangram games were, following statistical analysis, positively related to their performance in the Child Behavior Checklist, which indicated that the newly developed tangram games are reliable. Regarding Chinese and English visual-orthographic skills, the research indicated that the Chinese visual-orthographic skills of the participating children were positively correlated with games "1" to "4" (the positive correlation coefficients are between +0.22 and +0.40). While the English visual-orthographic skills of the participating children were only positively correlated with games "3" and "4" (the positive correlation coefficients are +0.21 and +0.29 respectively). Among the five tangram games, the researchers found that game "4" was the most relevant for assessing Chinese and English reading and word orthographic skills. Dr Wong said that tangram games are low cost, have endless possibilities, and share similar geometric figures with Chinese and English orthographies. Children can also learn languages while playing games, and such games also provide a way for parents and teachers to easily track assessments for children and adjust the learning progress according to each child's respective performance. Dr Wong added that in general Hong Kong children have a detailed and professional assessment at six years of age to test for learning disabilities such as dyslexia. Through tangram games, parents and teachers can grasp children's early literature learning abilities and provide professional support well before they officially start to learn and identify words. In addition, many Hong Kong children learn Chinese and English word orthographies and meanings through repetitive copying, the effectiveness of which has been called into question. However, from this research, although there is a distinct variance in Chinese and English orthographies, children still use copying techniques to learn these languages and have achieved certain learning outcomes. The research team is planning to co-operate with social service organisations and kindergartens to promote the tangram games so that more children can have their word identification ability tested with an initial assessment. The research, which is entitled "The Link Between a Set of Tangram-Based Tasks and Chinese and English Reading and Related Skills Among Chinese Kindergarteners," is published in AERA Open, an online journal managed by the American Education Research Association. Media enquiries: Mavis Wong from the HKBU Communication and Public Relations Office at +852-3411-7964 or hkbunews@hkbu.edu.hk.